We’ve been away on holiday so, what with Christmas and two weeks in the sun, we’re now even further behind with posts than we were. I have a lot to get through but this seemed like a good place to start. While away in South Africa (more on that to follow), we visited the Springfield wine estate in Robertson and tasted their Pinot Noir. It was suggested as a good pairing for duck, we agreed and packed a bottle into our suitcase so that we could try it when we got home. We didn’t wait very long before trying it. I’d frozen some bolognaise sauce which we ate when we arrived home on Friday night, this duck was Saturday’s dinner. 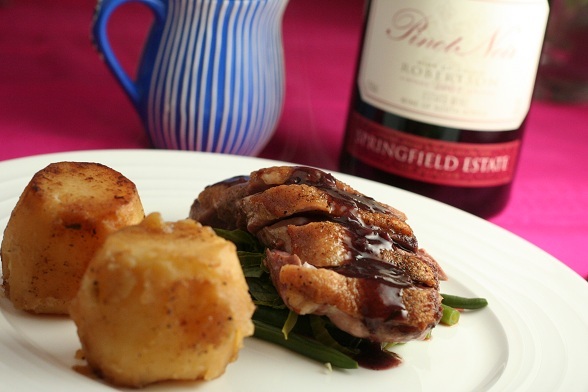 We cooked the duck breasts simply and made up a sauce with some of the Pinot Noir to accompany it, making sure we had plenty left to drink with the finished dish. The wine did indeed work brilliantly (I’ll ask Stephen to add some techinical stuff here) but the really great thing about this was the fondant potatoes. We’ve got these very wrong in the past but these were brilliant. The best part was that the potatoes were particularly floury which meant lots of soft pieces at the bottom of the pan which had soaked up plenty of butter and garlic. We ate those with a spoon after dinner and, to be honest, I could have easily just eaten a plate of those.